Placating a new CEO at the expense of employees suggests Brian Niccol might not gel with the restaurant's culture. Hiring Brian Niccol as CEO of Chipotle Mexican Grill (NYSE:CMG) was hailed as a smart move because of his success in transforming Taco Bell into an innovative, modern fast food chain. However, uprooting the fast-casual company's corporate home of 25 years to appease the incoming executive at a time when the business is still in a precarious situation may be a sign he will not integrate as seamlessly with the company as expected. 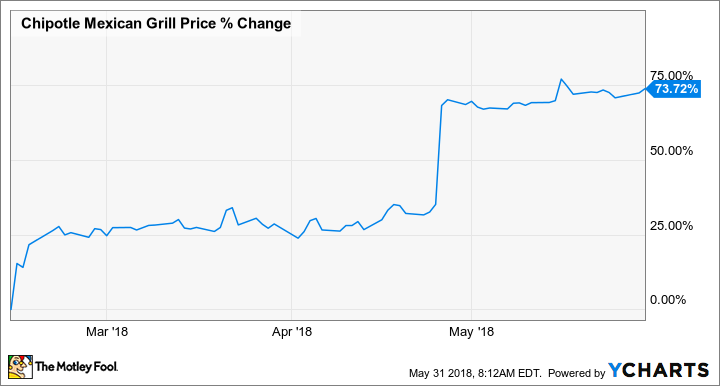 Chipotle Mexican Grill posted a better than expected first quarter earnings report in late April and Niccol was able to preside over a conference call with analysts that allowed him to lay out a strategy for the future. The response from the market was to send the stock soaring 24% and with the gains it has made in the weeks since, Chipotle shares are now up 75% since his hiring in February. That's a lot of betting that Niccol will be able to work his magic again, but it's still a tall order. Chipotle has yet to leave the shadow of its late-2015 E. coli outbreak, and while comparable store sales were up for the quarter, that was mostly the result of price increases. Profit margins were also higher but on weak comparisons as the bar was pretty low after years of dismal results. The more important metric -- guest traffic -- fell yet again, down 3.3% for the period, and winning back that customer loyalty remains a challenge..
Niccol laid out a roadmap on the earnings call of melding the menu with a digital presence to drive home to young consumers that Chipotle's "accessible food done fast" is still appealing. But he's also made sure the company is going to be distracted with other priorities, namely moving the company headquarters to his hometown. Even though Denver has been Chipotle's home since its founding in 1993, and despite having signed in December a 15-year lease to occupy a brand new office tower in downtown Denver, the restaurant recently announced it was moving its headquarters to the upscale city Newport Beach in California where Niccol lives. The move also impacts Chipotle's New York offices, which will be permanently closed and relocated to California, though support staff will be consolidated into offices in Columbus, Ohio. The relocation affects roughly 400 employees in Denver and New York as only some will be given relocation and retention packages. The upheaval will be spread out over six months despite the fact that this is a time Chipotle should be working to reestablish itself as the country's premier fast casual restaurant. The move is an unnecessary distraction and indicates Chipotle is putting the needs of its CEO over that of its employees. New CEO risks causing a tumult by relocating Chipotle's corporate headquarters so he can work close to home. Image source: Chipotle Mexican Grill. In the press release announcing the move, Niccol said the transition "will help us drive sustainable growth while continuing to position us well in the competition for top talent." The reality is more likely Niccol didn't want to move and relocating the offices was probably a condition of his accepting the position. Taco Bell headquarters, where he worked since 2011, is located in Irvine, less than 15 miles from Newport Beach. While a number of other fast food chains are located in the southern California area, including Del Taco, In-n-Out Burger, and of course Taco Bell, the idea Chipotle needs to locate there as well for business reasons seems specious. The disruption to employees and operations is a much larger concern. Chipotle was supposed to be occupying some 126,000 square feet of space across five floors of the new 40-story office building, but now it will be responsible for subleasing the space or finding a new tenant. Because of Niccol's background in marketing, and his success in using that skill to change the perception around Taco Bell, we'll likely see a much higher profile for Chipotle Mexican Grill. Those increased costs will eat into profits, particularly if its new delivery service continues growing as it did last quarter. The deal with DoorDash will also swipe profits from the restaurant, though obviously the hope is Chipotle will be making up in volume what it's losing on each order. Chipotle Mexican Grill isn't Taco Bell, however, and it's not quite clear that what worked with fast food can have similar results in the fast casual space, which continues to lag behind other segments of the restaurant industry. One quarter does not make a trend and feeling Niccol was the only person that could lead the turnaround so that already-set plans should be disrupted suggests the new CEO might not be the neat fit to the corporate culture he was originally believed to be.